On December 16, I attended the opening night gala event for 'Cartier and America'. This new exhibit, which celebrates a swathe of twentieth-century design trends, also demonstrates the extravagance and opulence of custom-crafted Cartier design. It's an elegant, vivid, surprising and thoroughly entertaining show. It is exclusive to the Legion of Honor. 'Cartier and America' was magnificently selected, rounded up, and planned by the museum's decorative arts curator Martin Chapman—who also wrote insightful accompanying notes, and produced the excellent book that accompanies this razzle-dazzling entertainment. The exhibit covers jewels of the Duchess of Windsor, Gloria Swanson and Elizabeth Taylor, along with Marion Davies and Grace Kelly, naturally—but it's the clocks and rich accouterments for clients like Marjorie Meriwether Post that are the surprise hit of this wide-ranging show. The major glam necklaces and animalistic bracelets and bigger-the-better engagement rings are divine—and they are fetchingly displayed in all their shimmering glory. No gilded leopard, coral owl, articulated crocodile, cabochon cuff link, or social essential for the El Morocco set, has been neglected. 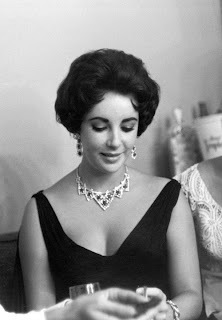 Elizabeth Taylor (in her heyday) is shown wearing the luscious diamond earrings and pendants Richard Burton showered upon her. Grace Kelly's finest sapphires, diamonds and pearls are on display, along with beautiful photographs of her wearing them. Many pieces are from Cartier's own archives—others are from private collections and have never been on display until this show. The subtext—well, one of them—is that newly wealthy tycoons and their wives and female companions spent a lot of time at Cartier, dithering over diamonds, sizing up the sapphires, eyeing the emeralds and ruminating over the rubies. Gloria Swanson's pair of articulated crystal bracelets with diamond insets are beautiful lit in a case that allows a viewer to see all effulgent angles. Much-married grandes dames were attracted to men who were knowledgeable about tiara settings and clocks with invisible machinations. It's the clocks that are perhaps the most bewitching. 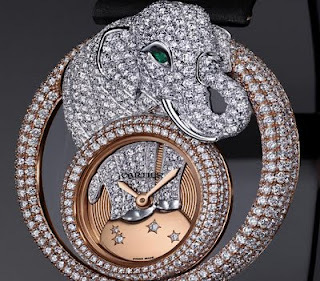 Elaborate set-pieces, with crystal clocks set on the backs of jade elephants, along with pendant clocks and fantasy clocks with precious stones and enamelwork ornamenting their framework, are entrancing, sheer delight. I can't wait to see them again. Another thrill here is to see the Duchess of Windsor's parures, and to read the notes about her endless 'fittings'. Gazing at her brooches and pins and bracelets, it's easy to imagine lives (and they are all spelled out and illustrated here in the vitrines) spent in this idle but important (to their social scene) pursuit. Martin Chapman does not hold back from illustrating the twentieth-century panoply of 'rich people's pastime' jewelry, travel cases, watches, gems, minaudieres, cigarette cases, card-holders, dressing table adornments and tiaras (la maharajah's treasure chest of those), as well as crowns, diamond pendants, and thrills for every poitrine. And if you miss this show, you must plan to be in San Francisco this summer when a thrilling collection of the creme de la creme of paintings from the Musee d'Orsay decamps from Paris and lands in California for six months. The Musee d'Orsay will be under renovation for some time, so the brilliant director of the Fine Arts Museums of San Francisco, John Buchanan, negotiated this coup for the city. A second show—equally fabulous—will follow next year. Imagine all your favorite paintings—Impressionists, Post-Impressionists, French classical artists at the Legion of Honor. I can't wait. See you at the gala opening night. the crocodiles... GORGEOUS.... i'm stumped and can't gather my thoughts enough to post a comment. Oh, how I would love to see this exhibit. 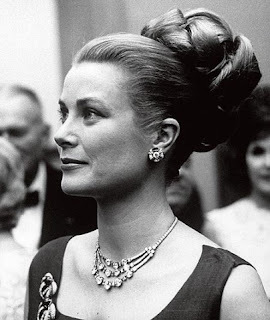 The images of Elizabeth Taylor and Grace Kelly donning these jewels are lovely. Happy New Year! This must be an amazing exhibit! 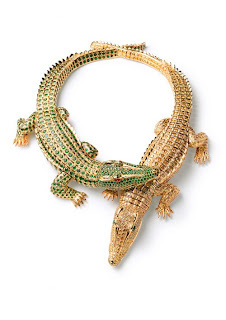 As if I could see only the corocodile necklace I would go! I am looking forward to your interesting post the next year! Many years ago I was in Venice for an exhibition at Palazzo Fortuny of Cartier Art Deco jewellery. As much as I loved to admire them (perfect location also)it was in my mind the thought: I wish there was a big party instead, to be able to see the jewels "living" on real people, decorating their bodies. Great images in this post. I am,literally, drying the drool from my chin! Have a very Happy New Year 2010! The Cartier show is one of the great and most surprising shows of the last year--decorative arts, indeed! I had just returned from India (so my head was full of India...) when I attended the gala opening night. During dinner, I slipped outquietly to the galleries to see the exhibit. Alone, with just a few friendly guards, I waltzed from one vitrine to another, in a golden daze. It was at the point where I read, in the notes, about the Duchess of Windsor having 'fittings' for her necklaces, that a whole way of life, a time, idle dukes and duchesses and tycoons and multiple marriages and diamonds galore--all painted a picture of dressing up, nightclubs, balls, marriages, guilty pleasures, and Cartier's fabulous craftsmanship. Clocks, incredible. You must see this show--worth a trip to San Francisco. Coming up next is the d'Orsay collection--and this is going to be a blockbuster. 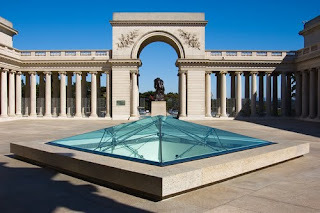 The LEGION OF HONOR is one of the world's great museums--a glamorous classical building standing high over the bluffs of San Francisco Bay, Golden Gate Bridge in the distance. Very dramatic. Collections include lovely Monets, Old Masters, Cezanne and of course the Rodins. Be sure to bow to the blue full moon on Thursday night...good luck for the year if you bow 9 times, turn around, and make a wish. I'm guessing you've been lying around at Rose Bay or Bondi Beach or Clovelly or Palm Beach or...Coogee! Or somewhere wonderful and luscious...lunch at Balmoral Beach? Camp Cove? Watson's Bay. All those great places I used to haunt with friends, spend the day, listening to 'beach radio' and getting a fabulous tan. (Now doctors are saying the sun is healthy...). 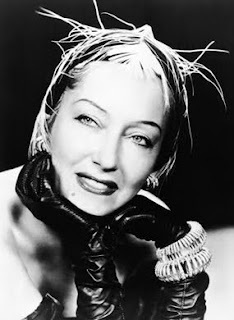 Yes...Gloria Swanson's baubles...to see them and imagine wearing them...or Liz Taylor's. Incredible show. Wish you could come and visit SF and see it. I was lucky enough to see the highlights of the Cartier show (or was it the whole thing) at Cartier, NYC earlier last year. Truly breathtaking as you say -and I loved the historical photos! I'll have to come see the musee d'orsay collection since I missed the museum while in Paris this past fall. You must see if you can engineer a visit to San Francisco before April 18 to see this Cartier exhibit. It has many pieces from private collections that were not in the earlier Cartier show. The d'Orsay collection: this is going to be the creme de la creme of shows...and will be enormously popular. The Legion is a superb museum...rather overlooked by some...and will be a handsome venue for this d'Orsay presentation. I loved your Paris reports--and hope you will travel there soon. Wonderful post! Now I must see the exhibit. All the best to you in 2010, Diane. Magnificent exhibit. I am always drawn to history and to marry the fabulous jewelry to their owners would be all the more thrilling. 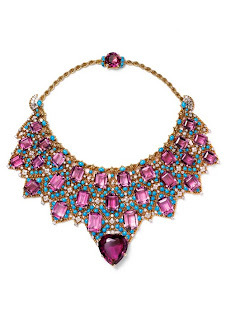 The 1947 bib necklace is stunning. Diane wishing you great joy and health in this new year. This Cartier exhibit is truly superb--and all of my designer friends are wild for it. This is a surprising show that has depth and lots of surprises (like the croco and alligator necklaces of Maria Felix, the Mexican film star (who knew??). I wish you brilliant and creative and surprising and wonderful and seat-of-the-pants 2010...with joy and laughter and much happiness. From the West Coast--I send greetings to the East Coast. I look forward to hearing from you in the coming year--and I'm so glad you're a member of THE STYLE SALONISTE. Keep us informed about your new books and projects. What a great exhibit. Thank you for sharing!